we see that it is only supposed to have 64K, however, it probably has 128K. Mine does! So, with a bit of ‘trickery’, we can make it work. The utility software (listed below) varies as to what interface it uses. 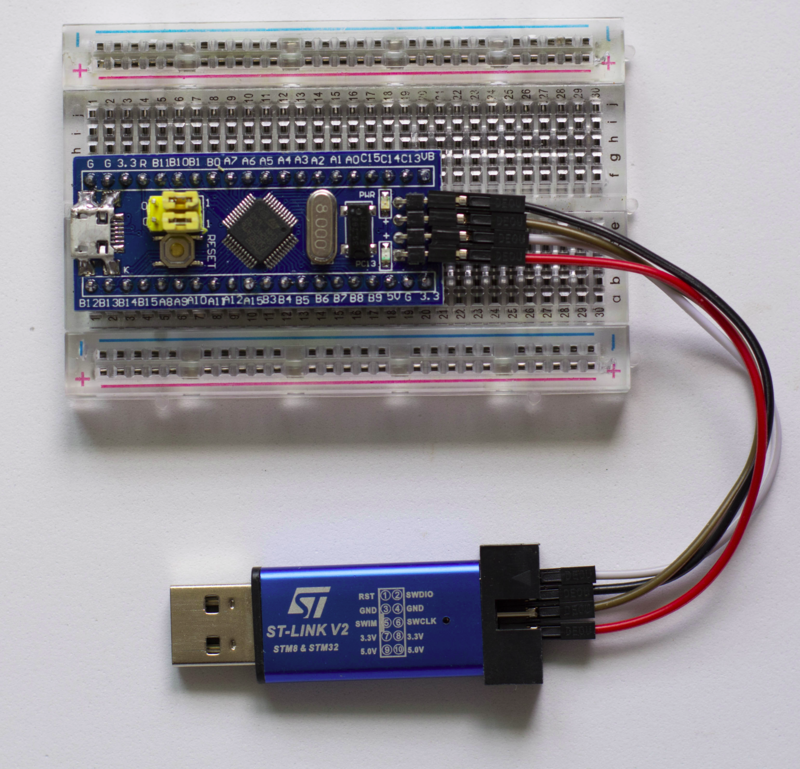 To get my STM32F103C8T6 module to work with the utility I need, I used an ST-LINK programmer which attaches to the SWDCLK/SWDIO/PWR/GND pins. Here is a list and some information about the software tools (utilities) you will run across when reading articles about programming the STM32F103C8T6. Incidentally, I run a Linux distribution called ‘Fedora‘. If you are running a different Linux distribution, you will need to run your appropriate package installer rather than the one (dnf) Fedora uses. For installing and compiling some of these utilites, you will need git, cmake and the ‘normal’ set of development tools installed. If you do any development work these tools should already be installed. Python script which talks to the STM32 bootloader (via the serial port) to upload and download firmware. DFU is intended to download and upload firmware to/from devices connected over USB. 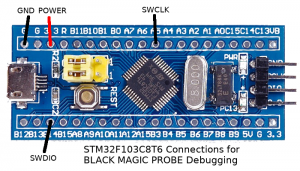 In-application debugging tool for embedded microprocessors. Note: Here is where the ‘trickery’ comes in. Using the parameter –flash=0x20000 we can override the reported 64K and specify 128K. Now you can unplug the STLINK programmer and plug in the usb port. You should then see two enumerated ports (probably /dev/ttyACM0 and /dev/ttyACM1). To make it easier, next time I wanted to do this, I created a Python script which runs those needed commands. Additionally, it combines blackmagic_dfu.bin and blackmagic.bin into one bin file called bmp.bin. The script allso runs stlink to dump the memory (after flashing) to compare it with the original to make sure the flash worked ok.
Make sure to replace the /dev/ttyUSB0 with your specific port. arm-none-eabi-gdb -ex "target extended-remote /dev/ttyACM0"
Further documentation on GDB (The GNU Project Debugger) can be found HERE. Thank you for the write-up, the –flash=0x20000 parameter helped me on a STM32F072 Discovery board. You’re welcome! If you have not taken a look at the forum at http://www.stm32duino.com/ you might want to take a look. Lots of very knowledgeable people there, and lots of info on STM boards. What about the power supply measurement? Is there a way to get the correct voltage? Hi, I am not sure I understand your question and how it applies to the probe. Can you elaborate? you might want to take a look. 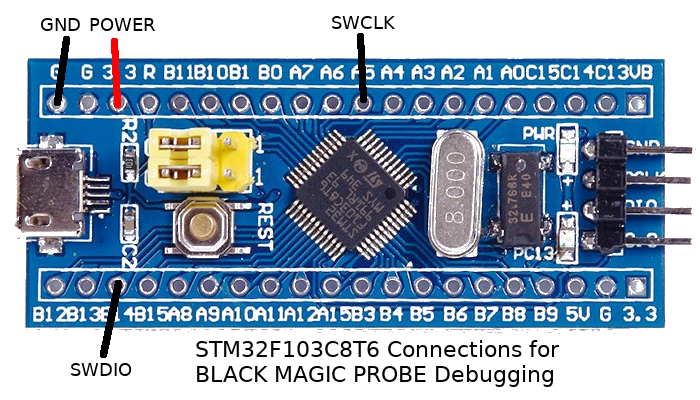 There is a whole sub-forum for the Black Magic Probe and the STM32F103C8T6. Lots of helpful info there. I might be able to get through this Fedora tutorial after all. I found another tutorial that is for Ubuntu however so giving it a go.